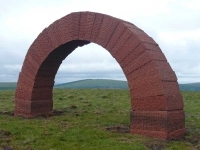 Striding Arches is an artist-led project ‘which celebrates and interprets a little known area of Dumfries & Galloway in south-west Scotland’. Andy Goldsworthy’s red sandstone arches ‘stride’ around a natural amphitheatre deep in the Southern Uplands. The Arches are formed from 31 hand-dressed blocks of red sandstone from a nearby quarry, each arch stands just under four metres high, with a span of seven metres, weighing approximately 27 tons, and is totally self-supporting. So that explains it! Glad I didn’t have to carry a piece up there. This entry was posted in Southern Upland Way and tagged Art, Scotland, Sculpture, Southern Upland Way, UK, Walking by Christopher. Bookmark the permalink.